From the hit film Pacific Rim Uprising, comes the film's most iconic Jaegers in model kit form! The Gipsy Avenger contains intricate detailing that has been faithfully recreated to resemble like that in the movie! The Pacific Rim Uprising Gipsy Avenger High Grade Model Kit can achieve a wide range of motion and articulation that allows for dynamic poses to help you recreate your favorite scenes! The Gipsy Avenger's iconic Chain Sword and Gravity Sling weapons are also interchangeable. All details down to the highly detailed joint system and screen-accurate weaponry are represented. Imitate the Gipsy Avenger's dual vortex turbines with the clear parts are used in the chest unit! 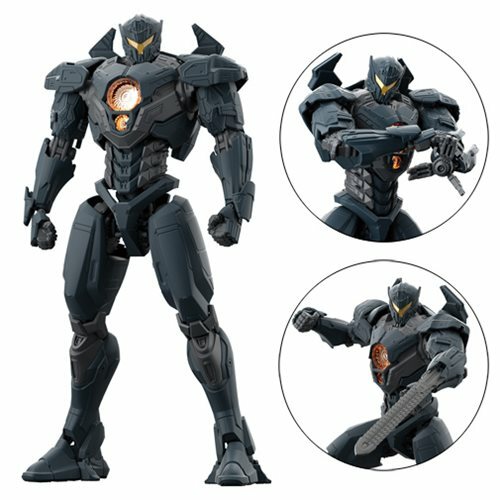 The Pacific Rim Uprising Gipsy Avenger High Grade Model Kit includes1x Gravity Sling firing mode recreation parts, 1x Plasma Caster firing more recreation parts, 1x Chain Sword 2.0 equipment recreation parts, 4x Runners, 1x Marking sticker sheet, 1x Foil sticker sheet, and 1x Instruction Manual. Measures about 6-inches tall.